Bleachers, classrooms, tents, and tour buses—all of campus was thrown open to visitors during Celebration Weekend in October. Nearly 600 families of current students attended, along with young alumni less than five years out, who were expressly invited to join a kind of homecoming to keep their Skidmore connections active. Highlights included varsity competitions and a pep rally, alumni-athlete sports contests, a student-clubs fair, and “minicollege” classes taught by faculty. Book-signings featured Prof. Gordon Thompson and his study of British pop music, former dean Claire Olds and her mem­­oir, Heather Moore ’08 and Prof. Bob Jones with their history of Skidmore’s original buildings, and Prof. Jay Rogoff with his latest book of poetry. 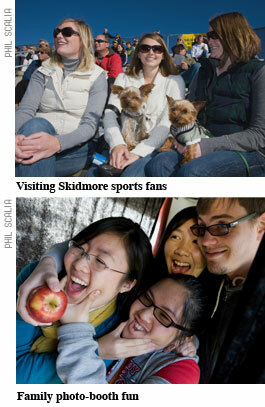 Sports fans went to the benefit dinner for the Friends of Skidmore Ath­letics and applauded new­ly inducted hall-of-famers. And student performers strutted their stuff.